Disney has been in the hearts of children for generations, and has continued to attract kids to their brand. A very popular movie was Cars, followed by the recently released Cars 2. Take it from a father of a three year old son, kids love the story line and especially the characters. Kids also enjoy playing with the latest gadgets no matter their age. One of the most popular gadgets is the iPad 2. 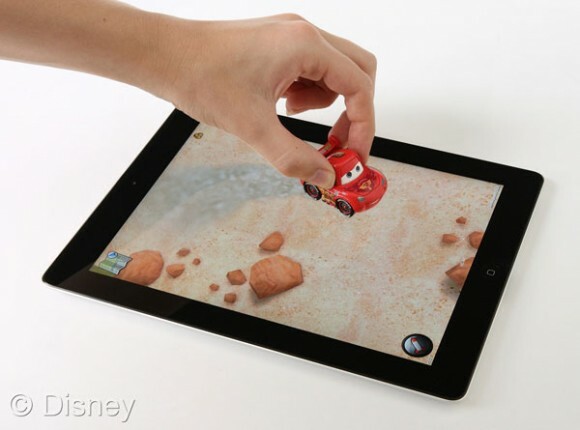 That being said, now kids can become the characters from the movie and use the iPad 2 as a virtual play mat thanks to Disney’s Appmates. First you’ll need an Appmate toy car, then magic begins when kids place their vehicle on the iPad and begin to explore the world of Cars. Each car becomes the character from the film, talking and making sound effects as you drive through various levels of fun. The car does what the driver wants the car to do. Driving around the world of Radiator Springs and discovering landscapes and hidden secrets starts as soon as the car is placed on the iPad. The fun doesn’t stop there, you can also perform missions unique to each character, race against World Grand Prix opponents and your Radiator Springs friends.